Humidity is notoriously difficult to measure. Some of the scientific and electronic considerations to measuring humidity include: analog to digital interface and external circuitry which might require op-amps or oscillator circuitry; temperature compensation adjustments to calculate dew point; calibration against a known humidity source; mounting, protection and response time in the real-world. The Sensirion SHT1x addresses many of these issues head on. It is a smart sensor for both humidity and temperature, and it comes from the factory in a tiny package that incorporates the analog to digital interface. All that your microcontroller has to do is read out the humidity and temperature values through the two-wire digital serial interface. The only math required is a simple scale and offset. The SHT1x is factory calibrated so that it returns temperature with a resolution of 0.01 degrees Celsius and relative humidity with a resolution of 0.03 percent. The accuracy is better than most other sensors too. Worst-case temperature accuracy is +/- 2 degrees C - but in the "room temperature" range the accuracy is better than +/- 1 degree C. The relative humidity sensor is similarly accurate: +/- 3.5% in the range 20% to 80%. This is quite remarkable for a low-cost sensor. Excellent for commercial or home-based projects that require such readings. 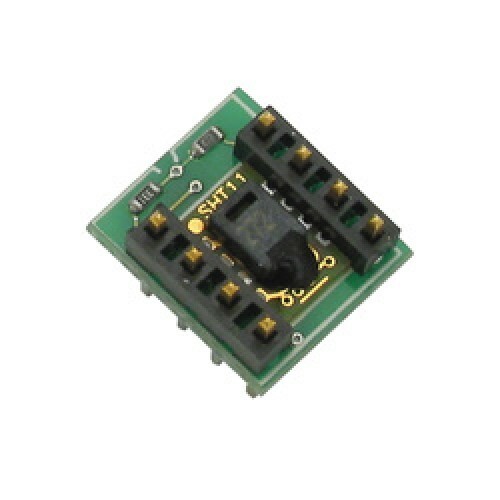 Based on a unique capacitive cell, these relative humidity sensors are designed for high volume, cos.. The DS1620 is a complete digital thermometer on a chip, capable of replacing the normal combination ..